Fighting boost spikes with the K04 or maybe boost creep with an internally gated GT3076R? Or have you gone all out with an externally gated setup? Whatever the reason, you have probably realized that the OEM boost control solenoid is not up to par and desperately needs something that is reliable and tunable. Introducing, the CorkSport Mazdaspeed Electronic Boost Control Solenoid (EBCS), the fastest responding, highest flowing, plug-and-play EBCS available today for the Mazdaspeed platform. 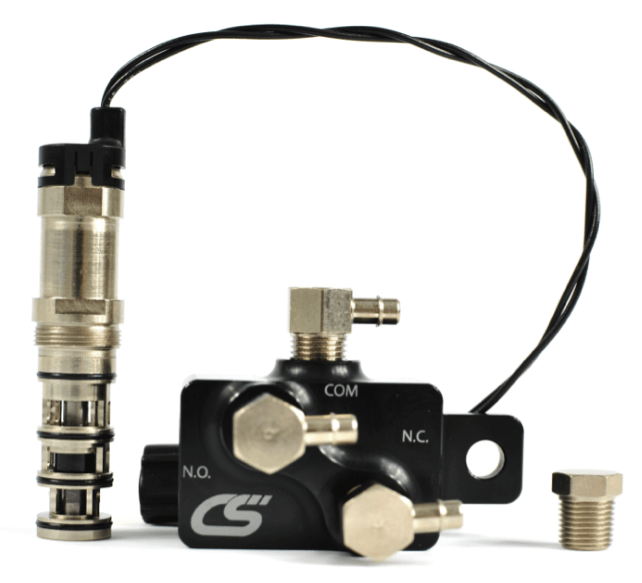 The CorkSport EBCS utilizes the latest technology in solenoid-controlled air valves, as well as using a light weight, low friction, and balanced valve design. The CorkSport EBCS will handle pressures from vacuum to 120psi with an operating frequency of 0 – 1000Hz and response time of 700µs. So what does this actually mean to you? You can build boost faster, reduce or eliminate boost spikes, and hold boost more accurately throughout the RPM range. Don’t believe me? 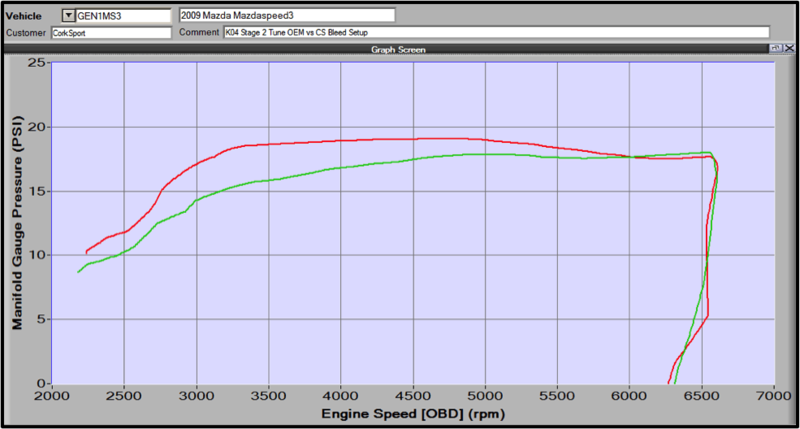 Then check out the graph below comparing the OEM EBCS to the CorkSport EBCS both in bleed setup. You can see a noticeable difference between the two graphs. Boost rises sooner, and there is no overshoot with the CorkSport EBCS. With the same Stage 2 tune, only changing the EBCS and adjusting the waste gate duty cycles, we saw an increase of 18 ft-lb of torque at peak due to the more boost at a lower RPM. Not only does the CorkSport EBCS work great, but it also fits great! Designed with ease of installation in mind, the EBCS can be located in the OEM location, or on the valve cover for turbochargers without the OEM tab. This goes for both TMIC and FMIC setups. There is also no wire cutting or soldering needed! 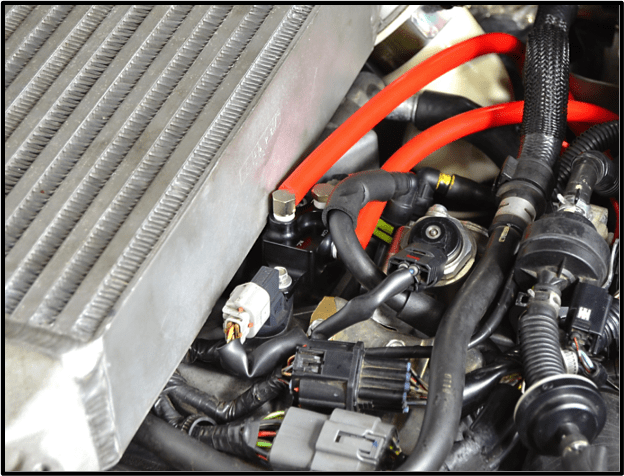 Simply plug the electrical connector into the wiring harness and you are ready to go! Whether you are just stepping into the Mazdaspeed world or are the horsepower king at the local dyno, there is a place under your hood for the CorkSport EBCS. This will benefit you from K04 to an externally gated GT3582R, and there are two ways to look at the CorkSport EBCS. First, it’s a potential power adder due to its far superior response time, efficiency, and accuracy; or second, it’s a safety device for the exact same reasons. Now there is one catch…correct use of the CorkSport EBCS will require adjustments of the waste gate duty cycles. We recommend you contact a professional tuner to setup your new CorkSport EBCS. Take control of your boost with the CorkSport Mazdaspeed Electronic Boost Control Solenoid! For more technical information check out our white paper write-up of the EBCS. Yes you can if you are running a cobb accessport or using tuning software. This is what I have in my MSP6, (Cobb AccessPORT ECU Programmer stage 2, CorkSport Oil Catch Can Kit, CorkSport front mounting intercooler kit, Autotech high pressure fuel pump upgrade, GReddy Type RS Blow Off Valves, 3″ Stainless catless downpipe , 3” pipe and 3” high flow cat with 93 gas octane) with my setup, do I install the CorkSport EBCS with bleed type setup or interrupt type setup? 2007 MS3: is there going to be a noticeable difference with this piece on the OEM turbo or is the OEM BCS sufficient/similar?